It’s hard to believe the month of May has come and almost gone. It seems like just yesterday this month was beginning! All that being said, it’s the last day of May, it’s Wednesday, and it’s time for another Hodgepodge. As always, thanks to our gracious hostess, Joyce, for keeping the fun alive. My family–all eleven of them! While growing up, all I ever really wanted to do was become a good wife and mother. I pray I’ve been successful in both endeavors. Ed and I will celebrate 45 years of marriage, next month. Together, we’ve raised three children, who have grown up to be adults we are very proud of, and enjoy spending time with. They, in turn, are doing a great job of taking care of their spouses, and raising children of their own. At the end of each day, I feel accomplished and very blessed. I honestly have no idea who the last two guests might be, but my first choice would be Dr. Charles Stanley. This man has a wealth of Christian knowledge and experience, and I’d love to talk with him about it at length. 3. Do you have a great burger recipe? What’s in it? What do you like on a hamburger and where is your favorite spot to order one out? My usual burger recipe consists of ground beef, bread crumbs, an egg, salt, and pepper. However, recently, we’ve discovered these great beef/pork mix hamburger patties in the meat section of Wal-mart. To these patties we just add some Grill Mates hamburger seasoning, and we grill them. They are fantastic! I like ketchup, mayo, lettuce, tomato, and pickles on my burgers, and my favorite burger place is Burger King. 4. What’s the biggest anxiety producing thing you do on a regular basis? Ed and I have no big summer plans. Hopefully, we’ll be able to finish harvesting what’s left of our garden, make some jelly, and simply enjoy each other’s company. Of course, we’ll also spend some time with family, and, hopefully, we’ll take a few day trips to St. Simon’s Island. When our harvesting is through, I’d also like to go for an overnight visit to see my brother, in Florida. When I posted, last Wednesday, we were in the middle of a downpour of rain. When all was said and done, we received over 9 inches of rain within two days. Sadly, all of our green bean bushes and an entire row of tomatoes [in our garden] drowned as a result of the downpour. The bushes were loaded with beans, and the tomato vines were loaded with tomatoes. It is a sickening sight to see our hard work ruined. However, all was not lost! We were able to salvage 13 quarts of beans off the dying bushes, and a kind man from church gave us 18 tomato plants to replace the ones we lost. Our second row of our tomatoes is still trying to hang on, as are the beans, peas, and our corn…but more rain is in the forecast for this week. If this happens, I’m not sure the rest of the garden will survive. For once, I hope the weather man turns out to be WRONG! I’m writing this while I wait for my ‘canned’ tomatoes to finish processing. When the tomatoes are finished, there is a bucket of peas on the floor waiting to be shelled, but who cares? Let’s blog a bit! I’m happy to say I’m feeling better than I was the last time I blogged. Ed and I have had a prosperous week, have canned many vegetables, but we’ve also taken some time to rest and relax. (No beach trip, yet, but we’ve enjoyed our front porch a day or two, late in the afternoons.) Yesterday, we even had a picnic under the carport, while we waited for tomatoes to can in the pressure cooker. To say the weather has been hot, here, would be an understatement! It’s almost unbearable, and we still have July and August to go. What a summer we’re having! We missed the extremely cold winter that was predicted for 2016, but our summer is more than making up for it. It’s been so hot, we’ve been running two fans for our outside animals. One fan is located in the chicken coop, the other is located on the front porch. Most of our animals are smart enough to take advantage of the extra breeze, even if the breeze does get a little warm by the end of the day! We always run fans in the summer, but not until July or August, usually. Gardening is coming to a steady close. I estimate we’ll be finished within the next two weeks, at the most. This summer heat is quickly rushing things along. Ed runs the sprinkler, daily, just to keep the remaining plants from drying up in the extreme heat. He gets his daily exercise from running back and forth moving the sprinkler every 45 minutes! I’m not sure what Ed and I will do for ‘excitement’, once the garden is finished, but I’m hoping we’ll make up for some lost time on St. Simon’s Island! The other day, we took a quick ‘road trip’, on some roads we’d never traveled (going from one Tractor Supply Store to another), and we both really enjoyed the new scenery. I wouldn’t mind just taking a couple of day trips, somewhere, just to see something different! Our youngest son, Brad, and his family have finally moved and settled into their new home. 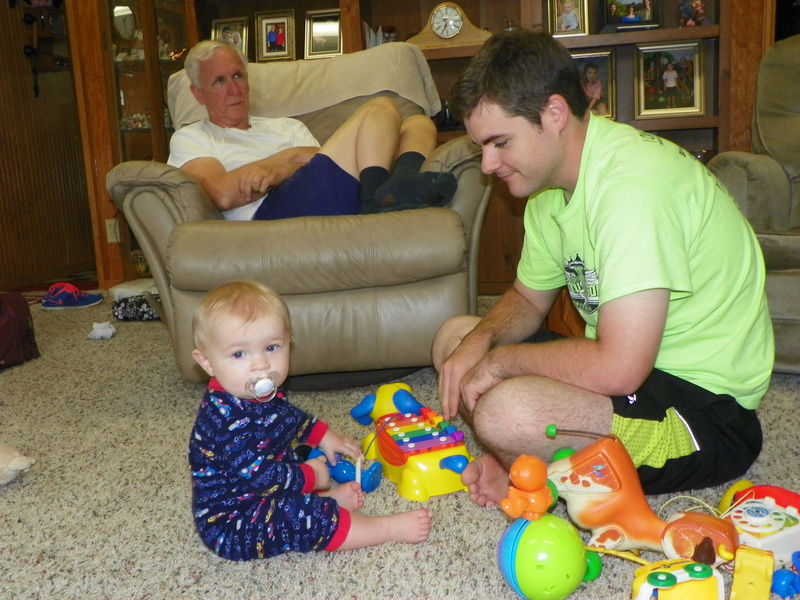 A couple of weeks ago, Ed helped them paint and move a few things, while I played with Evan, so Jennifer could get a few things done. We haven’t been back since they ‘officially’ got everything moved and settled, but we’ll be visiting, this weekend for a family get together. Speaking of Brad and Jennifer, they will celebrate their wedding anniversary tomorrow. Originally, they’d talked about getting married on mine and Ed’s anniversary, but couldn’t because the reception hall wasn’t available that day. So, they settled for exactly one week later, which is always easy for us to remember. Happy anniversary, a little early, you guys! May you have, at least, as many happy years as Ed and I’ve had (so far)! I heard this old song, today, and it immediately made me think of each one of our grown children, and the times they are now living through with their families! All have, or soon will, celebrate anniversaries of 5, 10, and 15 years. These are busy times, sometimes tough times, trying to raise family times, often with little time for romance...”but, it’s just another day in paradise” and the years they pass so quickly! When Brad and Jennifer recently bought their new home, a really nice washer/dryer set came with the house, so they ended up with two sets. The couple, knowing “the washing machine story” of Brett and Christina, mercifully, and generously, donated their extra set to them! No more “dancing machine” at Brett’s house! And this washer actually fits in the laundry room space, correctly! God is so good! The month of April has passed in a hurry, but it’s been an awesome month! Such a stark contrast to last April, when I was dealing with termites, mold, and sciatica, all at the same time! 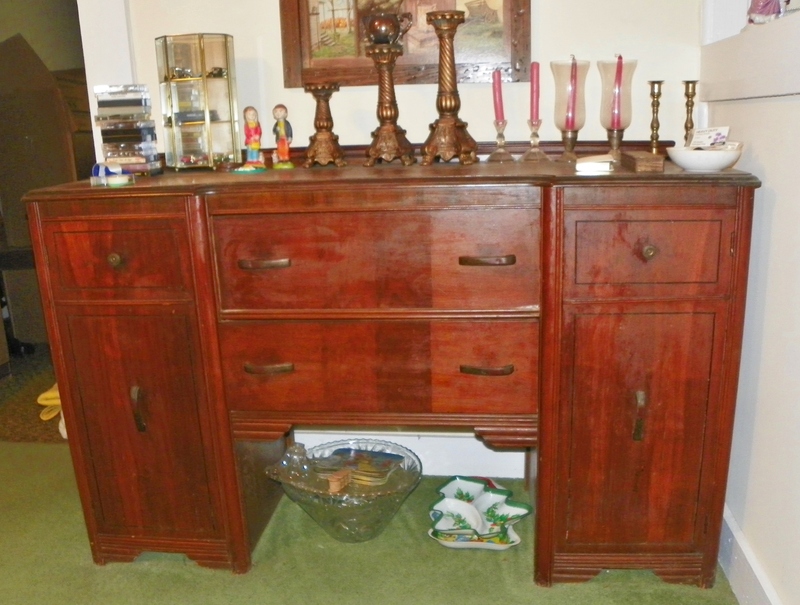 Thank goodness for new beginnings, and thank goodness for The Hodgepodge! As always, I’m thankful for our hostess, Joyce, too, who faithfully provides us with seven thought-provoking questions and a place to link up each week. I learned that our oldest son has been preaching on the first Sunday night of every month, since January of this year! Ed and I had no idea, and found out, quite by accident, when we visited our son’s church on the morning of April 3. I sat down, opened the church bulletin, and there was our son’s name, listed to bring the evening’s message! It was a most unexpected, but very pleasant surprise! Hickory Dickory Dock. We have too many clocks. At least one on each wall, and it’s a pain to reset them all! Hickory Dickory Dock! Rule 1: I had to be home from a date by 11:30. Rule 2: I was responsible for cleaning up the kitchen after supper every night. Growing up, I knew my parents weren’t very strict. After all, they let me start dating at the tender age of fourteen! I had very few rules, but I was a well-behaved, mature, and trustworthy teenager (most of the time). I met my husband-to-be, Ed, just three weeks before my fifteenth birthday, and the rest is history. We got married three weeks after I graduated from high school. 4. Tell us about a kitchen or cooking disaster or mishap you’ve experienced. Do you have many from which to choose? I remember cooking a “baking hen”, and making dressing for the first time, a few months after Ed and I were married. Both things turned out awful! Nobody ever told me how tough a “baking hen” can be, and a fork wouldn’t even pierce the skin when we tried to carve the thing. I didn’t have a recipe for dressing, either, so I improvised. My dressing tasted like twice baked cornbread, because that’s mostly what it was. 5. Plant a kiss, plant doubt, plant a tree, plant yourself somewhere…which on the list have you most recently planted? My answer is a toss-up between “planting a kiss” or “planting myself somewhere”. I do both of these on a daily basis! 6. What’s your most worn item of clothing this time of year? Are you tired of it? My most worn item of clothing, this time of the year, would be three polyester sundresses I’ve worn for the past four or five years. I’m tired of them, but I still love them because they are so comfortable! I wish I could find some new ones like them, but I haven’t been able to, so far. 7. I’m wrapping up the A-Z Blog Challenge this month and our Hodgepodge lands on letter W. What’s one word beginning with W that describes you in some way? How about a word to describe your home, also beginning with W? An adjective, beginning with “W”, that best describes me would be “worrier”. Although, I try not to worry about things, I just don’t seem to be able to help myself most of the time. I’m working on it, though. An adjective beginning with “W” that best describes our home is “worthwhile”, which means: worth the time, money, or effort spent; of value or importance. Our home may not be the grandest of homes, and it’s certainly not the most expensive, because we were on a shoestring budget while building, but Ed and I designed and built the entire structure, inside and out, from the ground up, with a lot of hard work, sweat, and even a few tears. Our little home is very worthwhile to us. My poor neglected blog is really bothering me. Lately, it seems there hasn’t been much time for it. I keep thinking I’ll get around to it, but then I never do. Today, I’m going to list a few fragments from the week, and link up with Mrs. 4-4-4-4 at Half-Past Kissin’ Time. I’ve been confused all week–running a day behind. Those long weekends tend to do that to me, or perhaps it’s my age creeping up on me 🙂 Whatever the problem is, it sure doesn’t seem like a Friday. Our fall peas are now ready to be picked, so guess where I’ve been spending some of my mornings? On Wednesday, I spent all day picking and shelling. Yesterday, I headed back to the garden to finish picking what I wasn’t able to pick on Wednesday. Considering it’s been very hot and dry, the peas have produced amazingly well. Bugs got to the earliest of the peas, but Ed seems to have those under control, at the moment. I’m SO ready to decorate for fall! Anyone else feeling that way? I hope to get my back-to-school tree decorated (with apples and teacher’s ornaments) over the weekend, if all goes well. I have some new fall porch decorations I’m dying to put out, too. Yesterday was a crazy day. Our oldest son called me at 7:30 a.m., to ask me if I could babysit their youngest son. His mother-in-law had just been taken to the hospital by ambulance, and his wife, Christina, needed to join her mother at the hospital, as quickly as she could. I had just ten minutes to get my outside chores finished, and be ready to babysit! I was still watering lettuce when they arrived. 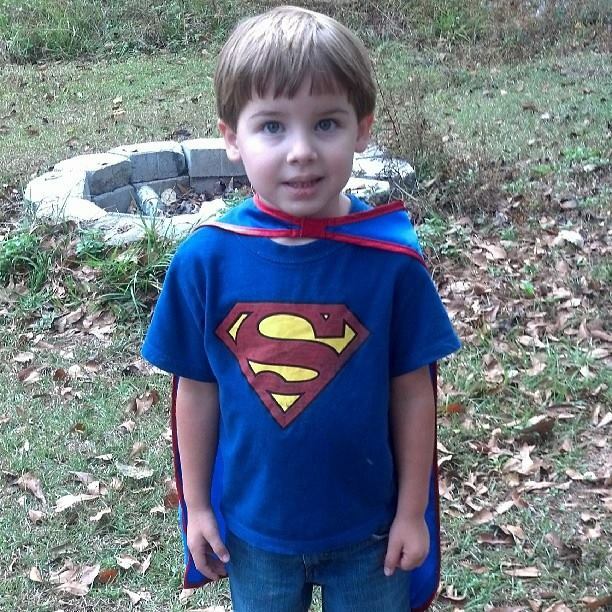 I kept Chase all day, and kept his brother, Caden, from lunch, when he got out of Kindergarten, until late afternoon. Granddaughter, Madison, joined us for a couple of hours through her lunch break from home school, too. 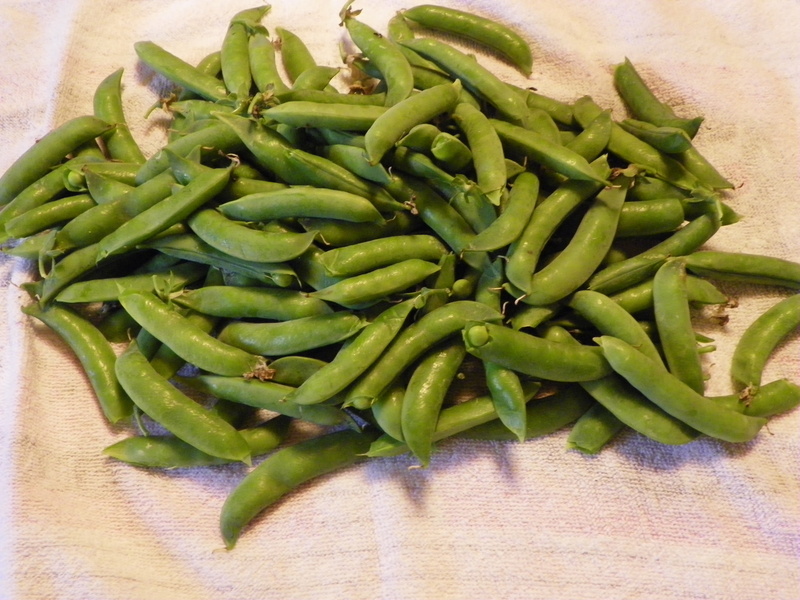 It turned out to be a busy day, since I was also trying to finish shelling and blanching peas from the garden. I had a good helper though. 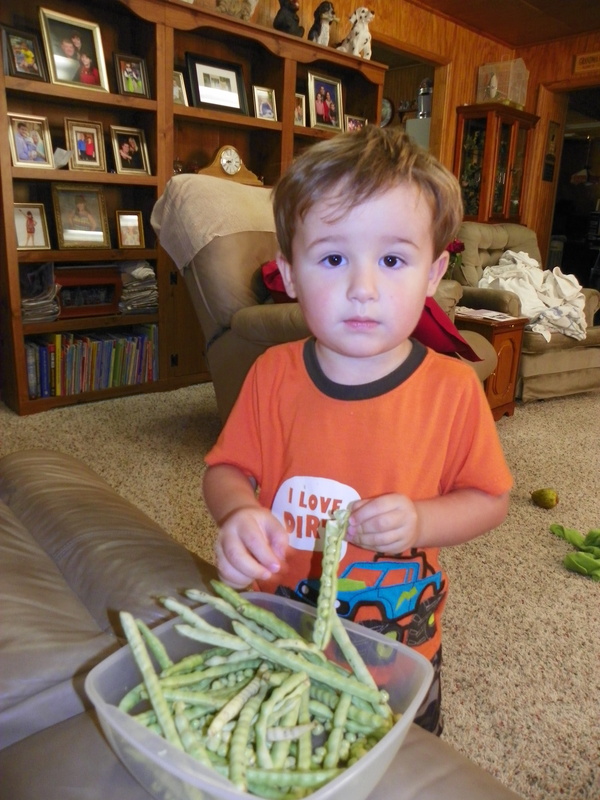 Chase enjoyed helping shell peas, and I just had to take a picture! I’ve shelled and blanched 10 packages of peas in two days, with more to come! Christina’s mama is very ill, and was actually moved to a larger hospital in the city. They’re still running tests to determine what the problem is. She was in ICU as of last night. I hope and pray she’ll be alright. In other news, Ed is continuing to pick up fallen pears off the ground! For some reason, they are rotting quickly, this year. He’s probably picked around 2000 pears! He stopped counting, a long time ago, at 1000. We have several grape vines, and it’s been a great year for grapes, too! There’s actually a pear tree, at Ed’s mom’s house, with grapes growing among the pears! The grapevine made its way over to the tree, and attached itself. I hope to get a picture of that soon, which I will share! I’m afraid that’s all the time I have for now. 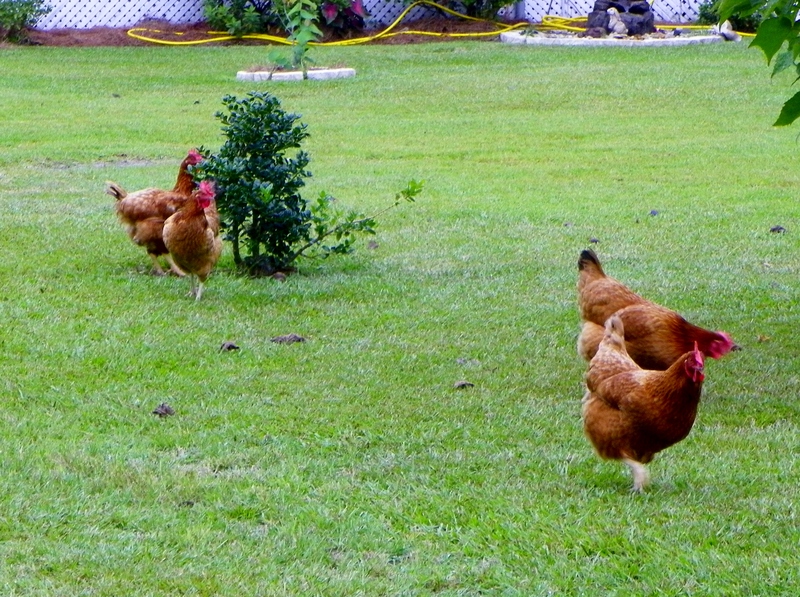 The chickens are waiting to be let out (so they can destroy the straw in my flowerbeds–again! ), the cats are waiting to be fed, and the plants definitely need watering. Until next time…Have a great weekend! Since I last wrote, another weekend has come and gone. They do come and go quickly, don’t they?! Since I last wrote, the first day of the new school year has come and gone. For some reason, our school district chooses to start back and get out earlier than most. Last Friday was ‘the day’. All of the little kiddos got dressed up in their new school clothes, and posed for ‘first day of school’ pictures–which were immediately posted to Facebook by their parents. My own little family wasn’t affected by the back-to-school hoopla since neither school-aged grandchild is enrolled in the public school system. In fact, both school-aged ‘grands’ and their families were gone (together) on a weekend trip to St. Simon’s Island, on Friday! That sounds much more fun than going back to school, doesn’t it? Since most of our family was out-of-town for the weekend, it was extra quiet in our neck of the woods. I didn’t even leave the house for the entire weekend, but we did have a little company for part of the weekend. Brad and his family came in late Friday night (after Jennifer got off from work), and stayed with us until after lunch on Saturday. It had been several weeks since they’d been to our house, because we made two trips to their house during July. Little Evan is crawling, pulling up and cruising everywhere! Babies sure do grow and change quickly. Evan turned 9 months old last week. Our little fall garden is really growing. The weather here has been so hot and dry, I’m surprised it’s still alive. Thankfully, we finally received a shower of rain on Saturday night. We were happy to see it! A few days ago, I saw a mama deer and her twin babies out in the field–in that grassy spot at the end of the garden! Every day I’ve been holding my breath, afraid that the deer will come over in the garden and eat our peas. Deer love to eat peas! Notice our sweet potato vines, to the right of the picture, are beginning to run. Rabbits love sweet potato vines, and we have an abundance of rabbits, too! Lately, “my girls” (aka the hens) haven’t been eating much. Usually, I can’t seem to fill them up, but a few days ago, they stopped eating very much. I’ve tried to figure out what could be wrong with “my girls”, but I’m clueless. I tried a different brand of feed, which helped, but only temporarily. Then we dusted them for mites, since some hens are losing feathers, too. I’ve been letting the hens free range more often since they still seem to enjoy foraging for bugs, but they’re losing weight. When they’re in their pen, they just sort of sit. I have a couple more things to try, but after that, I’m at a loss for what else to do. Who knew raising chickens could be so frustrating?! Speaking of frustrating, I can’t say a lot, but things at Ed’s workplace have been really frustrating and stressful for a while now. We’ve been through a salary cut and weeks of mandatory vacation days. Several people have lost their jobs, with more cuts promised, as the hospital attempts to ‘restructure’ itself. There has even been some talk of a total hospital closure. Ed’s future is uncertain at this time, and it’s very difficult going to work every day, wondering if it may be your last day… Last week, two of Ed’s co-workers (one with 35 years of service) were terminated. Wow, this post sure is full of ‘heavy’ stuff! Deer threatening our peas, sick chickens, and uncertain job security for Ed… Yeah, some days are just like that. Have a great Monday, y’all! I’m sure going to try! Since I was in a bit of a hurry when I blogged yesterday, I thought I’d take this chance to unwind a bit, and talk about what’s been going on around here, lately. 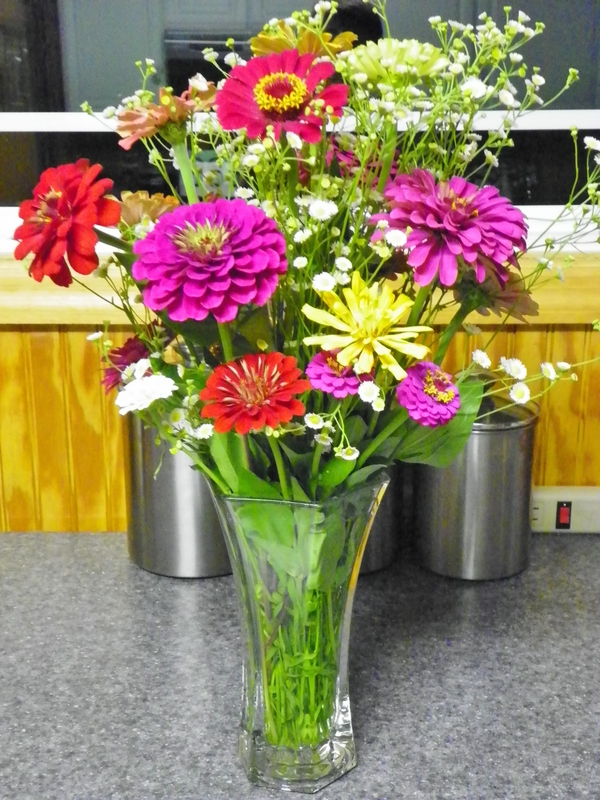 I’ll begin by showing off my newest bouquet from the garden–in one of Ed’s mom’s vases, of course. As I mentioned, Ed and I made another trek to St. Simon’s Island, on Friday. We almost called our trip off because it rained all night Thursday night. We finally decided to go ahead, and take a chance–rain or shine. The day was a bit overcast, but we don’t care much for being in the sun anyway. Fortunately, we didn’t see any rain, until we got back home! It turned out to be a good beach day for us, except for the lady with the six barking dogs! Why would anyone take SIX dogs to the beach??? They barked at everything, almost the entire time! FYI: I didn’t take a single picture. 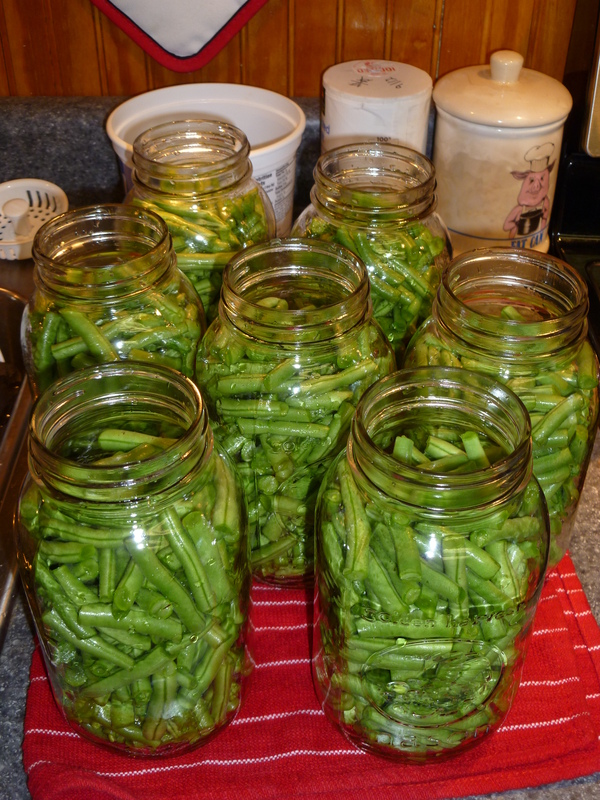 Over the weekend, Ed and I canned twelve more quarts of green beans, bringing our grand total up to forty-five quarts for this season! We’re officially finished with the beans, and that’s a great feeling! I’m still putting squash in the freezer though. We only planted four hills of squash, and grew more squash than ever before! On Saturday night, I tried something I’ve never done. 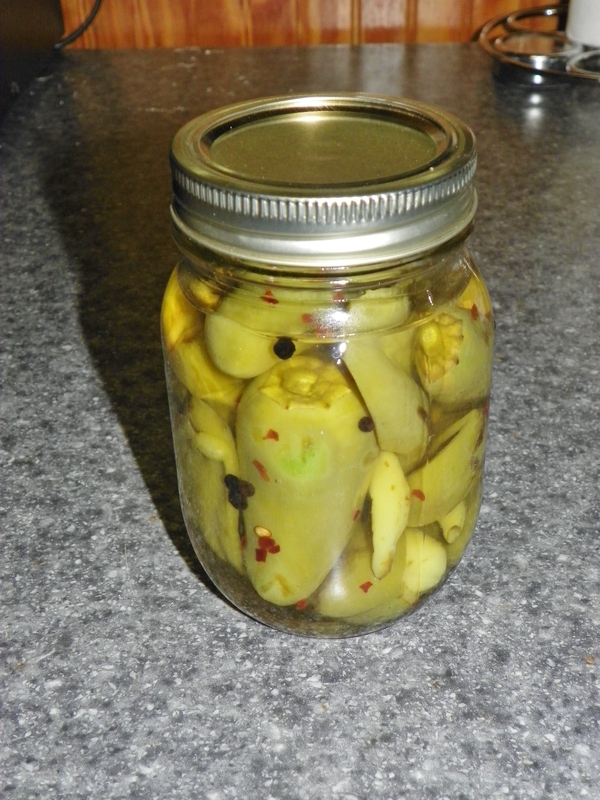 I made a jar of pickled peppers! This is our first year of growing peppers, and Ed wanted to pickle some. I wasn’t sure how to do it, so I consulted Google, and found a video on YouTube. I only made one jar, and they turned out great–or at least I think they did. We haven’t opened them, yet. On Sunday, I cooked dinner for two of our three children and their families. (Our oldest son and his family were on vacation.) I used to cook Sunday dinner every week, but don’t do it much, these days. Everyone seemed to enjoy the lunch of roast beef with fresh vegetables, along with the blackberry cobbler and banana pudding for dessert. We had a great time reminiscing about old times, afterward. 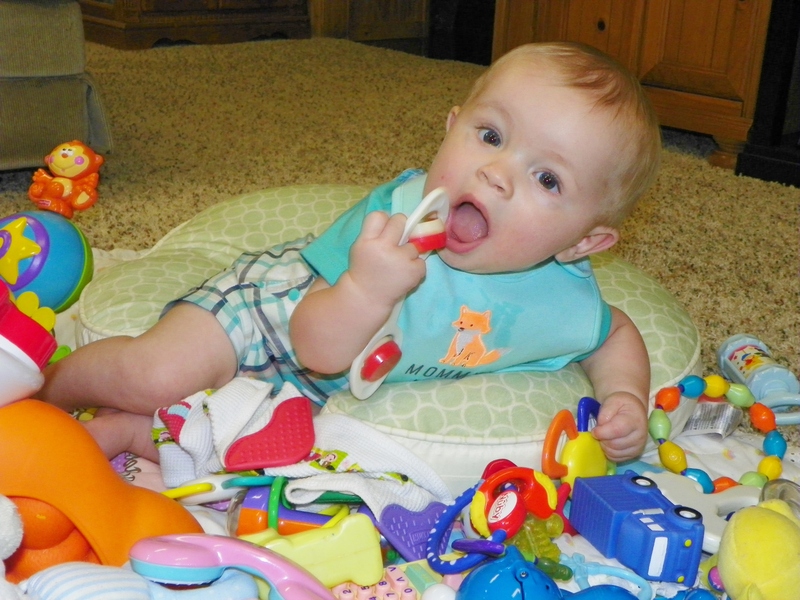 As you can see, little Evan (our youngest ‘grand’) isn’t so little anymore! It’s amazing how much he grows and changes in just two weeks’ time. He’s a busy little fellow, these days, and I was only able to capture one picture of him. Everything goes straight into his mouth, these days! This time, I’ll only have to wait five days to see Evan again, because all of the family has been invited to Brad and Jennifer’s house on Saturday! They’re having a cookout for everyone, with swimming afterward. I know the grandkids will love that! The new kitten is doing well. I’m still deciding on a name for it. I keep calling it different names, waiting to see what it best responds best to. So far–nothing! By the way, I think ‘it’ is a ‘she’! She is very ‘spirited’, and likes to stay right under my feet. I’ve been leaning heavily toward the name “Lucky”, but if she doesn’t stay out from under my feet, that name may no longer apply! That crazy little kitten actually likes to chase the chickens, too! No fear! Speaking of the chickens, another one of our hens became ill, yesterday. Why is it always something, lately?! She was fine yesterday morning, but by the afternoon, she wasn’t. I’ll be watching her closely today to see how it goes. (I’m thinking – now I know why people butcher and eat their chickens each year, then get a new flock!) If this one dies, we’ll be down to just three hens! It’s getting time to decide whether to continue this venture or get out. Yesterday was a hot day! I don’t know what the high temp was, but at 9 o’clock, last night, it was still 81 degrees! Today appears to be headed in the same direction. As of 6:30, this morning, the chickens now have a fan blowing inside of their coop! Lucky girls–except for the one who’s not feeling well. That’s pretty much what’s been going on around here. So what have you been up to, lately? Do tell! This old blog is probably feeling a bit neglected this week, but then again, so is my house. Lately, I seem to be spinning my wheels and not getting a whole lot accomplished. It could have something to do with me not feeling well… Perhaps, next week will be better! Anyway, I’m ending the week with a few fragments of what’s been going on around here, and linking up with Mrs. 4-4-4-4. Ed and I picked our garden peas on Monday. I put three packages of them in the freezer, and we’re saving the rest for seed. I’m not much of a fan of garden peas, but these are so good! We’ll have some fresh squash to eat by next week, and should have some green beans in a couple more weeks. The sweet onions are almost ready, too! I love having garden-fresh vegetables to eat! We finally got over two inches of rain, this week. We didn’t see any leaks from the roof, so I think it’s safe to say Ed has our leak fixed, once again. It rained almost all day yesterday, and our grass and our garden is grateful! I guess Ed will do some grass cutting and hoeing time this weekend. I may do some hoeing, as well, but I don’t mow grass! Ed and I ended up going to St. Simon’s Island on his mandatory day off on Wednesday. It was our first beach trip of the season, together (I’ve been twice without him). The island wasn’t crowded at all, but by 1:30 we had to pack up and leave because it started raining! It was okay, though, we spent the rest of the afternoon shopping in Brunswick, another favorite past-time of mine. There’s a lot of truth to the Kenny Chesney song, Don’t Blink, don’t you think? We need to savor every moment of life that we can! Go out and make it a great weekend 🙂 See ya’ back here on Monday. Well, here it is the Friday before Easter, and the weather has been rather chilly this week! Oh dear spring, where have you gone? It’s also been rather wet, with 3 to 4 more inches of rain forecast over the next two days!!! We may need galoshes for the egg hunt, on Sunday. Speaking of those Easter eggs, I have 216 plastic eggs waiting to be hidden! Instead of stuffing the eggs with candy, this year, I stuffed them with pieces of paper saying what kind of candy was supposed to be inside. In case you’re wondering why I did this, it’s because our yard is so sunny, now, I’m afraid the candy inside of the eggs will melt before the eggs are found! We’ll just have to swap paper for candy afterward. Of course, it’s entirely possible the sun won’t even shine, so all of my work may have been for nothing! I’m looking forward to having our family together again, this weekend. That doesn’t happen nearly enough, these days. Everyone is supposed to gather here tonight, so the grandchildren can color eggs together. We’ll eat supper afterward. Everyone will return again, on Sunday, for lunch and an egg hunt. With all of the rain in the forecast, I’m rethinking having Ed cooking on the grill. I think I’ll go to town and pick up a ham! I had an unexpected, but very welcome visitor, yesterday. My long-time friend, Diane, was in town and stopped by to see me for a couple of hours. Usually I travel to her house, so it was a rare treat to have her at my home. Diane and I have been friends since high school, and although we don’t see each other often, we are always able to pick right back up where we left off. We have a beach trip planned for a couple of weeks from now, and we’re both excited about that! Everything in the garden is up and is doing remarkably well, considering the cool weather we’ve been having. The weeds have already begun to grow, so I spent some time hoeing, on Monday. Our radishes are ready, so I gathered a few for a salad, the other night. It’s too bad our lettuce and tomatoes aren’t ready, too! Again, I’m not sure what 3 to 4 inches of rain will do to things, so I’m holding my breath. Last year, about half of our garden drowned in July. Ed and I recently had the pleasure of attending our granddaughter, Madison’s, violin recital. It was the first music recital I’d ever attended, and I really enjoyed it. Ed, on the other hand, played the piano while growing up, so he’s been to many music recitals! Let me begin by saying how impressed we both were with Madison’s violin teacher! She gives violin lessons at her home, every week, to 23 students–in addition to teaching violin at a nearby school! She only charges a few dollars per lesson, plus she furnishes instruments to her students! As a result of her generosity, many children are able to take lessons, who, otherwise, might not be able to afford to. What a blessing this lady is to our community! As usual, I’m linking my fragments up at Mrs. 4-4-4-4 at HalfPastKissinTime. Her Tercentennial Celebration is still going on, so head on over there and check it out! I must say, this week has been relatively calm compared to last week! No hammering, no sawing, and no unintentional cutting of our electrical wires, since the workmen finished their part of our construction, last Friday. Thank goodness for the quiet and calm! Ed and I still have some work to do on the porch before it’s completely finished. We have some painting to do, and Ed needs to cut off the new posts of our step railings. I’m sure we’ll get this stuff accomplished–eventually. There’s always something to do, and there’s never enough time to get it done! Speaking of the ‘wire cutting incident’, when Ed put the wires back together, he accidentally traded places with two of our light switches. As a result, every time I turn on the lights in the living room, I end up turning on the ceiling fan instead (they’re on separate switches)! I wonder how long it will take to retrain my weary brain to flip the first switch instead of the second one. Ed offered to switch them back around, but I figured a challenge is good for me! Eight days and counting… I still haven’t retrained my brain! We bought a new charcoal grill, a couple of weeks ago. Ed finally got around to putting it together yesterday. Our plan is to grill on Easter Sunday. It will be something we haven’t done before. Somehow, the thought of slaving over a ham or a turkey just didn’t seem appealing, this year. Oops, is my age showing? We had a mini storm on Monday afternoon. The wind blew in from the west, which is never a good thing, because we still have lots of tall pine trees on that side of our house. Ed and I watched in horror as the tops of those pines twisted and twirled in the wind! Some good-sized limbs fell near the chicken house, and nearly gave ‘the girls’ a heart attack! We later learned that a tornado had touched down just a few miles away. Some of our garden has sprouted! Most of the seeds that we planted last Tuesday have now come up. It sure looks good to look down the rows and see those little green vegetable plants! Unfortunately, weeds will soon follow. I guess I’d better get ready to hoe! One more thing to add to our ‘to do’ list. Lately, I’ve been enjoying watching the birds around the yard. They’ve been enjoying the warm temperatures and sunshine. Our daughter has a couple of bluebirds nesting in a bird house in her yard. Apparently, they have babies because I watched them taking food into the bird house, on Saturday. Some mockingbirds have a nest in the cedar tree, as usual. Ed and I, also, have a cardinal couple who regularly come to pick up the stray food from around our chicken’s pen. We have a bird feeder, but this couple seems to enjoy stealing the scratch food. I’ve spent a great deal of this week trying to finish and upload the last of my video montages from One True Media over to YouTube, since One True Media is going out of business next month. I only have six weeks left before all of my videos will be deleted, unless they’re published on YouTube. Unfortunately, lots of other customers must be doing the same thing because it’s taking FOREVER to get a video to process! I spent two days waiting for the video, below, to process! Believe it or not, I’ve posted 77 video montages to YouTube, over the past three years. Here is a montage of our tree cutting experience, last summer. It’s worth watching, especially if you’ve never seen anyone walk up, tie off, then cut down some VERY TALL pine trees (which happen to have been located VERY CLOSE to our house)! It amazed me to learn that the tree climber had once fallen from a tree, landed on a concrete picnic table, and shattered one side of his entire body! He wasn’t even expected to survive, yet there he was, climbing trees again, believe it or not! Thanks to Mrs. 4-4-4-4 at Half-Past Kissin’ Time for hosting Friday Fragments each week. It’s always fun to link up and see what everyone else is ‘fragging’ about, and she’s, also, having a celebration all month! You should check it out! Daily, I’ll ask myself – Now what in the world did I come in here for? or that ‘age old’ question – What am I going to cook for supper? I planted an entire rose garden thirty-six years ago, and one-by-one, all of my rose bushes died the following year! I never tried having a rose garden again. These days, I have one small (pink) miniature rose-bush growing out in the yard. It must be a tough little bush because it often gets neglected, and it’s been there for several years. As for my favorite color of roses, I like pastel pink best, but yellow comes in a close second. My neighbor (across the field from us) has one of the prettiest rose gardens around here. She loves doing yard work, and apparently has a green thumb! 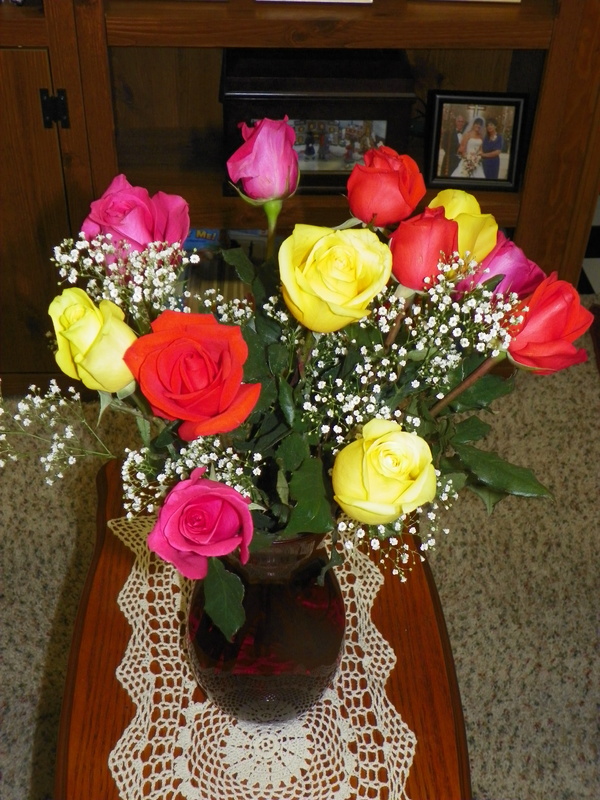 My sweet husband, Ed, usually surprises me with a dozen roses a couple of times a year, but I actually bought myself this dozen rainbow rose assortment, at Easter time–because they were on sale and I liked them! Bright orange roses complimented the pink and yellow ones, and made a very colorful bouquet. Yes, I do read the freshness dates on grocery items, and I won’t buy items if they are close to expiration. I will use eggs past their ‘use by date’, as long as it’s within just a few days. I’ll also take medication if it’s recently expired, but I don’t really like dented cans… Go figure! I doubt I will ever accomplish this in what’s left of my lifetime, but I’d love to learn how to play some kind of musical instrument–like a piano or a guitar. I probably should be more realistic and just strive to get all my photos into scrapbooks! What an interesting thought! If I had twenty acres of land (ocean front, of course! ), and plenty of money, I’d build some condos, keeping an apartment for myself, as a summer get-away. I’d rent or sell the other units for a source of retirement income! That’s a tough one. I hate to be late, but I don’t like to be the first one to arrive to a party either! I’d probably show up around 7:10–and feel guilty for being late! Once again, I’m behind with posting and visiting on-line friends. I’m sorry, but it’s been busy here in our neck of the woods! In addition to painting the front porch, I’ve picked, shelled, blanched, and frozen several packages of garden peas in the past few days. It’s dry here, so I’m also dragging 150 feet of water hose around the garden, and moving around 300 feet of soaker hoses, at least once a day. No rain in sight. I’ve lost two more pounds since I began gardening last month! Who needs a gym membership?! Our family had an old-fashioned Memorial Day cookout on Monday–and we ate outside, too! Fun times with family. Jennifer’s pregnancy is beginning to show a bit. Sixteen weeks and counting… Soon we’ll know the gender of grandbaby #4. I broke a tooth over the three-day weekend, and had to visit the dentist on Tuesday. Not a fun time, but thankful for my dentist and the fact that he could fix my tooth! I’ve been having tooth issues for over a month. It turned out the cracked tooth was also causing the tooth below it to throb (before the cracked tooth actually broke)! 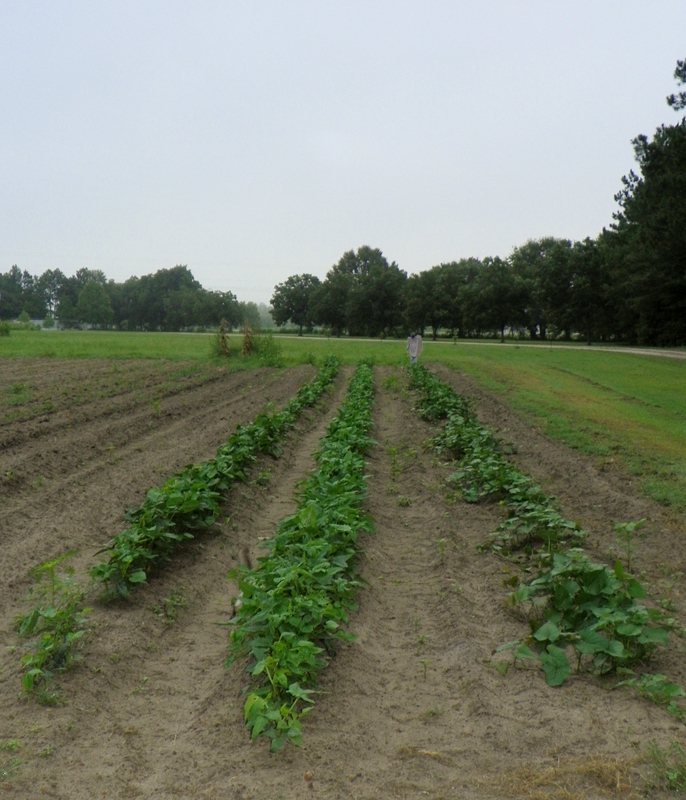 I picked a 160 ft. row of green beans, then snapped them by myself–before I went to the dentist on Tuesday. I came back from the dentist, then had to ‘can’ all those beans, cook supper, and water the garden. More fun times! I’m canning green beans this week, so I’m not sure when I’ll have a chance to post again, but I’ll be back as soon as I can. In the meantime, I’ll either be in the garden or in the kitchen, with the exception of my one-day trip to the beach. Fun times!